I was born in Gelsenkirchen in November 1945 and grew up in Witten, also in the industrial Ruhr area. The boredom of the school lessons has been balanced with photography and with the publication of a school newspaper. After military service I arrived in Berlin in April 1967 in the middle of the beginnings of the student movement to study law at the Free University Berlin. In 1968, I interrupted my studies to work for half a year as a German teacher in Eskilstuna / Sweden. There I made my first key experiences with alternative teaching methods. Judged in the school as linguistically unskilled I learned Swedish in three months and then luckily also English (which had not worked in 7 years of school). And my students were able to communicate in German even after three months. Learning success depends on the specific, individually fitting learning and teaching method. 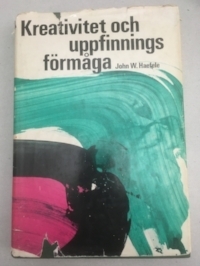 In "Kreativitet och uppfinnings formoga", the Swedish edition of an American book from John Haefele, to my great surprise, it was not only claimed but prooved that creativity is not an exclusive talent of a few geniuses, but is rooted as a potential in every human being. The ability to find new ideas can, once discovered, be unfolded and strengthened. The different methods and techniques can help here. For now over 50 years the topics of learning, motivation and creativity are an important part of my private and professional studies. At the beginning for personal reasons to better master the challenges of study and life. But quite soon I started to enjoy to transfer the knowledge gained to other people. Since I financed my studies myself and wanted to earn a reserve for the exam preparation, after some failed attempts and a further interruption of my studies, I finally became so successful as a sales representative of a US cosmetics company that I became Vice President of Sales for Switzerland in a very fast career movement. There I was able to mobilize the self-motivation and enthusiasm of the employees in daily use with the unconventional learning and, above all, training methods of this company. At the same time, the quarterly sales and profit reports to the parent company were a permanent challenge to my own and the creativity of everyone involved. So, very early on, the content of the books became lived reality, not only with me but throughout the whole company. Due to the early accidental death of the founder and the incorrectness of his successors, my trip to the corporate world was abruptly ended. But at least I could finish my studies that way. During the first professional years as lawyer, I started a weekend-workshop with my brother, who studied medicine, for students to help them with the successful completion of their studies. It became more and more obvious: psychology of learning quickly reaches its limits when it comes to the practical. Since the mid-seventies, I have been increasingly immersing myself in brain research, which was more and more accessible to interested amateurs at that time, in order to penetrate deeper into my two main interests of learning and creativity. There was a third interest in the practical work. At the international leadership conferences, the founder of the cosmetic company told us again and again: »There are countless books and workshops about employee motivation. We should not be confused by that. His credo was: As a leader you can not really motivate other people. It is more important to recognize the self-motivation of people and to strengthen this intrinsic power. However, most executives are slowing down or demotivating their employees. That was unconventional but extremely helpful. At the beginning of the 1990s, this personal experience was solidly confirmed by Reinhard Sprenger's book – a documentation and reflections on the »myth of motivation« (German: »Mythos Motivation«}. As a manager you can not motivate employees. Performance - at least in the long run - always is based upon their self-motivation. At the beginning of the eighties I started parallel to my law office a publishing house where I published books on applied brain research. »Unicorns are real«, »Free Flight«, »Intuitive Management«, »Mind Mapping«, »Being in your Right Mind«, «Frankenstein's Castle» and »The Right Brain Experience« - all license issues from the Scandinavian and English-speaking world are appeared in my »Synchron Verlag«. After about ten years I transferred these books to GABAL publishing house and closed my law office. First a side effect of my student workshops, workshops for companies developed more and more into my main business. In 1987 I organized my first own creativity workshop at the Ruhr University Bochum followed by several hundreds of workshops with Nixdorf, Bosch, BMW, Henkel, Service Plan, Springer & Jacoby, Kraft Foods, Unilever, Lehnkering, Clausecker-Bingel, pilot group and other companies and organizations. The encounter with the writer and creativity expert Marilee Zdenek, who I invited to Berlin on the occasion of the German publication of her book »The Right Brain Experience« in 1988, and with whom we organized a two-day creativity workshop with more than 700 participants, has become particularly influential for my own work We met several times first in Los Angeles, then Santa Barbara but also in San Francisco and in 2014 on the occasion of her 79th birthday in Berlin. From her I learned a lot of what I now use in my own workshops. Thus, during my time as a publisher, I was able to make intensive personal experiences with the development of the »vertical dimension of creativity«. 1990 I received a promotion with a dissertation »Creativity and School« and was rewarded by a doctorate in law from the University of Hamburg. For more than seven years, in addition to my already busy time, I had been working to proof that a selection of school guidelines for some of the arts subjects in various federal states are violating Article 2 (I) of the German »Grundgesetz« (the constitution of Germany). The publicity of this book supported the fight of teachers and parents to protect the creativity of the students against creativity suppressing school guidelines. Since 1992 I have worked exclusively as a trainer, coach and author, as well as a lecturer at German and international universities and universities. I have worked with students at the Bavarian Academy of Advertising, Maximilian University Munich, the University of the Arts, the Technical University, the Humboldt University and the Free University, all in Berlin. I have been Visiting Professor in Auckland, New Zealand and Concepción, Chile. Whenever possible, I have sought direct personal contact with the brain researchers and pioneers. Very early I met Karl Pribram, whose »Plans and the Structure of Behavior« (together with George A. Miller and Eugene Galanter) fascinated me, Klaus Hoppe, who supervised the so called «Split Brain« patients of the research of Roger Sperry and his team and has made significant contributions to creativity research, Humberto Maturana, Francisco Varela, Heinz von Foerster, whom I was allowed to visit three times in his house in Pescadero, Paul Watzlawick, Dietmar Hansch, Joseph Weizenbaum, Michael Gelb, Mogens Kirckhoff to mention only a few of the best known. The first meeting with Mihaly Csikszentmihalyi in 1995 established the foundation of a long term friendship. He too was originally a creativity researcher, who then researched »optimal experiences« also called »flow«. This concept occupies me for many years now and I have been in close contact with him since then and had many encounters in the USA and in Berlin. The flow concept of Professor Csikszentmihalyi integrates all aspects of learning, motivation and creativity. By his support I met at the international conferences for Positive Psychology: a.o. 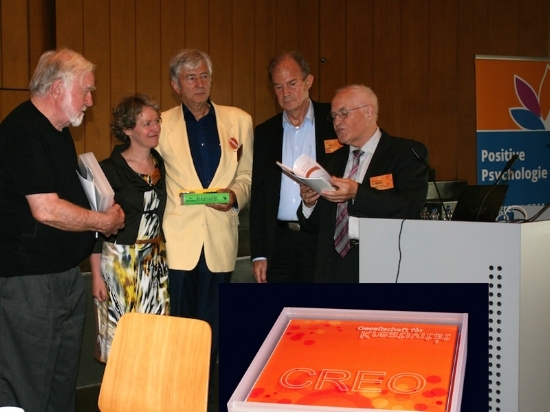 Martin Seligman, Jeanne Nakamura, Barbara Fredrickson, Howard Gardner, Antonella Delle Fave, Gerd Gigerenzer and Falko Rheinberg. From 1994 to 2007 I presented, together with other lecturers, the now legendary »Mind Flow Mallorca« workshops with hundreds of participants in monasteries on the island. Over the years, in addition to the various methods, the development of the vertical dimension of personal creativity played a major role in the workshops, above all in the concrete development of product ideas, claims or new processes in companies. 2011 I founded »Die Flow Akademie« in Berlin together with the psychologist Laura Ritthaler, where we offer special training programs for coaches. The two topics of learning and creativity also play a key role in this advanced education. Given the uncritical enthusiasm for the digital, I would now like to warn against seeing the solution to all the massive economic, social, and political problems in the hope and focus on almighty algorithms, or solely on creativity methods and techniques. And at the same time it is important for me to clarify immediately that it is not an either - or but a both - as well as. Therefore I have decided to re-intensify my work of developing personal creative resources in a new format. You are cordially invited to join! Zertifizierter Lehrcoach der European Coaching Association und Mitglied der Deutschen Gesellschaft für Kreativität. Noch mal danke von ganzen Herzen für die wunderbaren Tage! Unternehmen, Organisationen und Hochschulen für die ich arbeite oder gearbeitet habe.